Heavenly Father, My Hope and My guard, we thank you for preserving our life. We thank you for hearing our cries for help and healing. We thank you for guiding our feet into ways that have been a blessing. 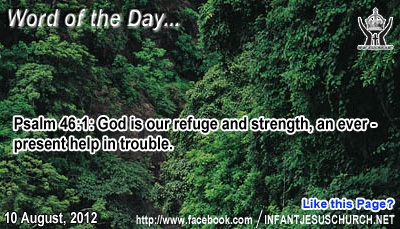 O God, stay close by as we face the stresses and challenges in our life. Through your Spirit, enable us to grow and be an example to others as we pass through life's storm. In the name of Infant Jesus we pray. Amen. Jesus illustrates his parables from the common daily circumstances of life. His audience, generally rural folk in Palestine, could effortlessly understand the principle of new life produced by dead seeds sown into the earth. What is the pious similarity which Jesus alludes to? This, perhaps, an indirect reference to his own approach to death on the cross and his resurrection on the third day. Or does he have another kind of "death and reincarnation" in mind for his disciples? Jesus, no hesitation, had both sanity in mind for his disciples. The image of the grain of wheat dying in the earth in order to grow and bear a harvest can be seen as a symbol of Jesus' own death and burial in the tomb and his rebirth. Jesus knew that the only way to conquest over the supremacy of sin and death was through the cross. Jesus upturned the curse of our first parents' disobedience through his compliance to the Father's will – his willingness to go to the cross to give the just penalty for our sins and to overcome death once and for all. His obedience and death on the cross get for us freedom and new life in the Holy Spirit. His cross frees us from the oppression of sin and death and shows us the way of ideal love. There is a great contradiction here. Death directs to life. When we "die" to ourselves, we "rise" to fresh life in Jesus Christ.